We have hand picked each item in the Porter Cable 7424 XP and Meguiar's Polish Kit because they are highly effective when paired together. To create the best kit possible we utilize our years of detailing experience, combined with input from some of the best detailers around the country. We are confident you will get outstanding results with each item and really enjoy how your vehicle looks afterward. Save $22.44 off of the retail price of individually purchasing these items! Like others have written, I was a novice machine polisher before purchasing this kit and I'm really glad to have selected it. I recently purchased a 2009 Toyota with very low miles, but amazingly dingy and dull Polar White paint. I used the 105 and 205 followed by good old Megs cleaner wax applied with a black pad and the results were spectacular. Part way into the job it became obvious I needed more 3M tape, larger bottles of 105 and 205, and a bunch more pads, but DI came through again Newbies: buy this kit, read Todd's write up on this system, and go for it. I doubt I could have done this job without DI! Really can't beat the price of this package. 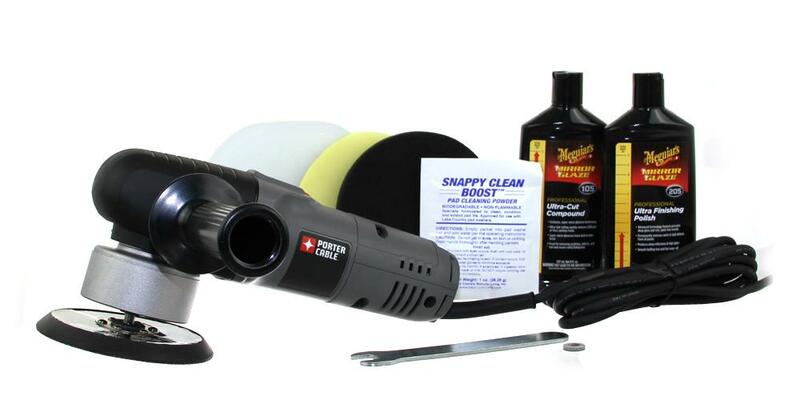 This is an excellent starter kit, and will do a good paint correction for most cars on the road. Some cars with finicky or really soft paint may require different pads, but the yellow and black ones that come with the kit served me well. Got my trusty 2005 S2000's paint shinier and smoother than new, even with 150000 miles on the clock. Excellent product that polished our cars to look better than new. I was a novice car cleaner that's never polished a car and now they looked like they came back from a high end detail shop. I would recommend this kit to anyone who has never detailed a car but always wanted to but fearing they would mess up their paint. You cannot go wrong with this kit.